Here's a way you can support Soul of Somanya every time you shop on Amazon without it costing you an extra cent! 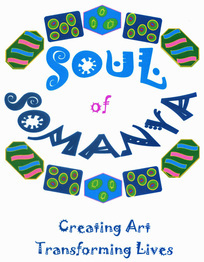 Soul of Somanya is a 501(c)(3) non-profit organization based in Chattanooga, Tennessee. But the real action takes place in a town called Somanya in the Krobo region of Ghana, West Africa, where we are working hard to provide living-wage employment in the field of jewelry- and basket-making for young adults whose prospects in life are otherwise very grim. Jobs are scarce in Somanya, especially for young people with little education and no skills. Many are forced to migrate into the cities looking for work. There, with heartbreaking frequency, they end up living nightmare lives on the streets, victims of sexual exploitation and other kinds of violence. Their children often end up abandoned or orphaned. When you buy our products, you provide a market for the goods that these talented young people create. This, in turn, allows us to keep them working at a steady living wage.